The Blue Ridge Mountains are a source of beauty and inspiration; a place for recreation and renewal. They enhance our mental, physical, and spiritual wellbeing. We honor and respect them. The mountains are a source of clean water, fish, wildlife and biodiversity. We endorse and protect the right of all living things, now and in the future, to benefit from mountain ecosystems. The mountains are essential for sustainable social and economic development. We make choices and take actions that ensure long-term sustainability. The mountains are an integral part of our cultural and natural heritage. We take that heritage into account when we make decisions that affect the mountains. It is a privilege to live in the mountains, and with privilege comes responsibility. We support responsible stewardship of mountain lands and waters. We are stronger and more effective working together than we are individually. 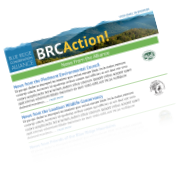 We commit to working together to protect the Blue Ridge Mountains.